These three Hallmen have committed to take their academic and athletic talents to the collegiate level. On Saturday, April 6, Calvert Hall defeated Archbishop Spalding and Century in the playoff round of It's Academic. The match will be televised on May 25 at 10:00 a.m. on WJZ TV. CHC will compete in the semifinal round on May 5. 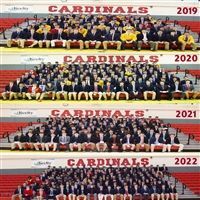 The Calvert Hall It's Academic team won the Catholic League Championship on Tuesday, March 26, 2019. They finished the 2018-2019 season 9-1 and have an astounding 56-4 record over the past 6 years. 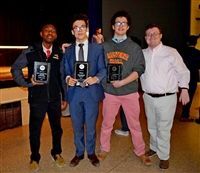 Brian Reed ‘21 and Eugene Bressler ‘21 won Policy Debate while Michael Kosmas ‘20 won in Dramatic Performance. Daniel Christ '21, Brandon Hermosa '21, Eric Sabatino '20, Steven Johnson '19, Christian Garman '21 also qualified for the National Catholic Tournament taking place this Memorial Day Weekend. The Calvert Hall Instrumental and vocal programs took home top awards at Festival Disney. John Moses ‘19 earned top male vocal soloist, Jack Little ‘19 earned top jazz instrumental soloist, and the jazz orchestra earned best in show. Click here to watch their performances. Thank you to all of our benefactors for their support during the 2017-2018 fiscal year. We are grateful for your generosity. Click here to view the Annual Report on Giving. Calvert Hall College High School is pleased to announce the trustees of The Sheridan Foundation have awarded Calvert Hall a $50,000 grant. The grant will support the J. Wilford Sheridan ’27 Scholarship which is used to assist students in the La Salle Program. Social Studies faculty member, Frank Passaro, was named Teacher of the Year at Maryland History Day. Team 5588C won the Maryland State Robotics tournament and placed 1st in skills competition. Calvert Hall had four teams quality for the Vex Robotics World Championships. Team 5588C 5588D 5588E and 5588V will compete on the world stage next month. No other private school had more teams qualify than Calvert Hall. 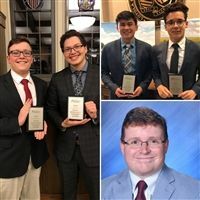 Four Calvert Hall students qualified for the National Speech and Debate Association National Tournament which will be held in Dallas, Texas in June. Only the top 3% of all speech and debate students nationwide qualify for this tournament. 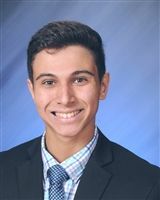 Nathan Valencia '19 finished first in Original Oratory and Michael Kosmas '20 finished first in Dramatic Interpretation. In debate, Daniel Christ '21 and Brandon Hermosa '21 earned a spot to nationals in policy debate. The CHC policy debate team also won the Policy Sweepstakes, an award given to the school with the best policy debate teams in the districts. Calvert Hall Speech and Debate Coach, Peter Susko, was named the Chesapeake District Coach of the Year. The nationwide competition was fierce and CHC showed schools from all over the country how remarkable our students truly are. 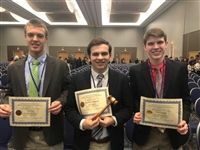 CHC earned Best Delegate (John Moses ‘19) and two Honorable Mentions (3rd place- Casimir Pozecki ‘20 and Brennan Kelly ‘19) at the Johns Hopkins Model UN Conference. These ten Hallmen have committed to take their academic and athletic talents to the collegiate level. 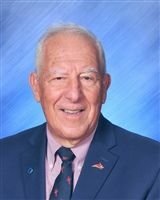 Augie Miceli, Sr., AFSC, has shared with the Calvert Hall community that he will retire at the conclusion of the 2018-2019 academic year. 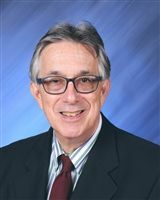 This marks the end of an era for the longest tenured faculty member who has given 60 years of service to the school. The It's Academic team won big in the first round of the show. Calvert Hall racked up a score of 665 defeating Bryn Mawr (310) and Patterson Mill (270). The trio of Dean Ceresini '19, Aidan Scible '20, and Andrew Sontag '19 will return to competition on April 6 for the playoff round. The first round victory will air on Saturday, March 9 at 10:00 a.m. on WJZ. 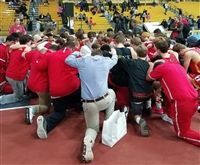 The Varsity Indoor Track and Field Team captured their first MIAA team title in school history on Friday, January 18. The JV team captured their 4th consecutive team title. The JFK Named Essay Writing Contest was established in May 2005 by Mr. Richard A. Lidinsky, Jr., Esq. ’64. Mr. Lidinsky provides a financial award for members of the junior class who compete in the essay contest based on a subject related to John F. Kennedy, Jr. Mr. Miserendino '99 selects the topic and grades the essays. This year's winners are Taigh Donovan '20 (1st place), Benjamin Dodson '20 (2nd place), and George Carey '20 (3rd place). Members of the Future Business Leaders of America competed in the regional competition at Hereford High on January 7, 2019. Chris Conroy '19, Cole Johnson '20, and Brady Organt '19 finished first in the Social Media Campaign event. Additionally, they finished in the top three in four different events. They will now advance to the state competition in March. Calvert Hall was also highlighted for being the only private high school in Baltimore County with a chapter.